Combine all ingredients for dressing in a blender and process until smooth. Correct seasoning. Liberally brush the quails with half of the dressing and allow to marinate, refrigerated, for 1 hour. Prepare the grill. Grill the quail for 3-5 minutes on each side or until the quail are completely cooked Be careful not to burn or overcook the quail. Place the salad in the center of the plate. 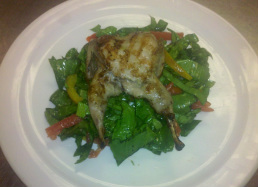 Remove skewers from quail (if using) and place on top of the salad. Drizzle the remaining vinaigrette over the quail. Chef: plumped up nicely, moist, but still some pink (good color). The bird flavor is very distinct, some of the other options have more marinade flavor; choosing to highlight the marinade or the bird is a personal preference as a chef, both are OK. The dressing on the salad was nice, but could use more black pepper; good consistent cuts on bell peppers. Personal/Team: I grilled these low and slow and tried to get nice grill marks on the quail. The flavor was good and the bird was really moist. I thought the salad was pretty and colorful, could have done without the green bell peppers, they lose color when grilled. I kept the spinach in a larger, rustic chop instead of a finer chiffanod and thought it offered a better appearance and made the spinach stand out more. Lessons Learned: I just love quail. Cooking it is fun and it tastes great. Things to think about when grilling quail; the skewers can help the grilling process when trying to turn the bird. quail are so small and they can get stuck in the grill grid. If using the skewers, you will have to either remove them and prepare the quail further instead of serving with holes in it or use the skewers for part of presentation.